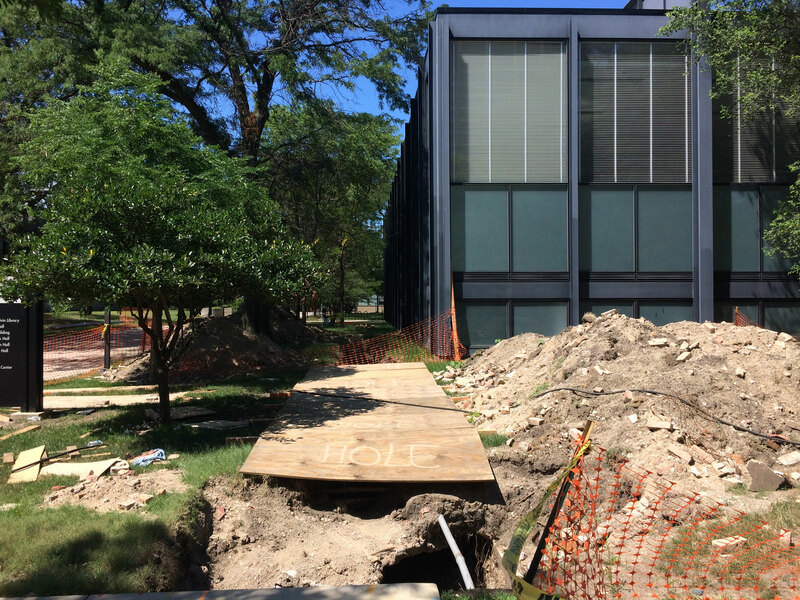 Summer term at Chicago‘s Illinois Institute of Technology College of Architecture is typically uneventful, but excitement recently percolated to the surface after a maintenance project uncovered a bit of history beside the school’s home in S. R. Crown Hall. The existing building, widely regarded as one of Mies van der Rohe’s masterpieces, stands on the site of the former Mecca Flats (or Mecca Flat), a storied residential building that once stood at the intersection of 34th and State streets. As workers were digging a trench for a new condenser pipe along the west side of the building, they uncovered the tiled floor of the basement of the Mecca Flats, which revealed the building’s design in bright and vivid colors. The Mecca Flats was built in 1892 and was expected to house visitors to the World’s Columbian Exposition in 1893. At that time State Street was a line of racial division with white residents to the east and African American residents to the west. The building’s location immediately west of State made it challenging to attract upper middle-class white tenants as originally intended, and in 1911 the owners of the building retracted their all-white tenant policy. Thereafter the building quickly became populated by African American tenants who were eager to rent sizable apartments in a relatively new and well-designed building. 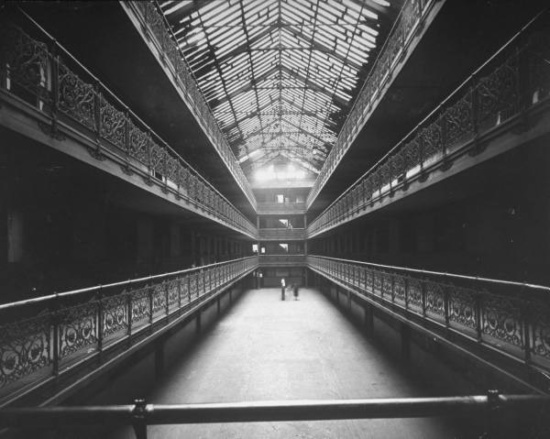 The building’s innovative design (by the Chicago architecture firm Edbrooke and Burnham, no relation to Daniel) featured a pair of quadruple-height skylit interior courts surrounded by stacked open corridors with ornately-detailed iron guardrails. Residents could enter the building directly through these interior courts, prompting the central space to become an extension of the street life along “the Stroll,” as the entertainment strip on State Street was known, and which by the 1920s had become a destination “jammed with black humanity” and brimming with jazz clubs and cabarets. The open interior also contributed to an atmosphere of irreverent social drama in which residents could observe each other’s comings and goings. The vibrancy of the building inspired musician Jimmy Blythe to write “Mecca Flats Blues” (1924) and, later on, Gwendolyn Brooks to write “In the Mecca,” (1968) a long narrative poem reflecting on the Black experience in the building’s later years. As the building fell into disrepair, IIT purchased the Mecca and spent 15 years fighting with residents and housing advocates who opposed the university’s plan to demolish the structure as part of the expanding campus. The Mecca was finally demolished in 1951. Knowledge of the design of the Mecca Flats was relatively limited because the building survived only in black and white photography. 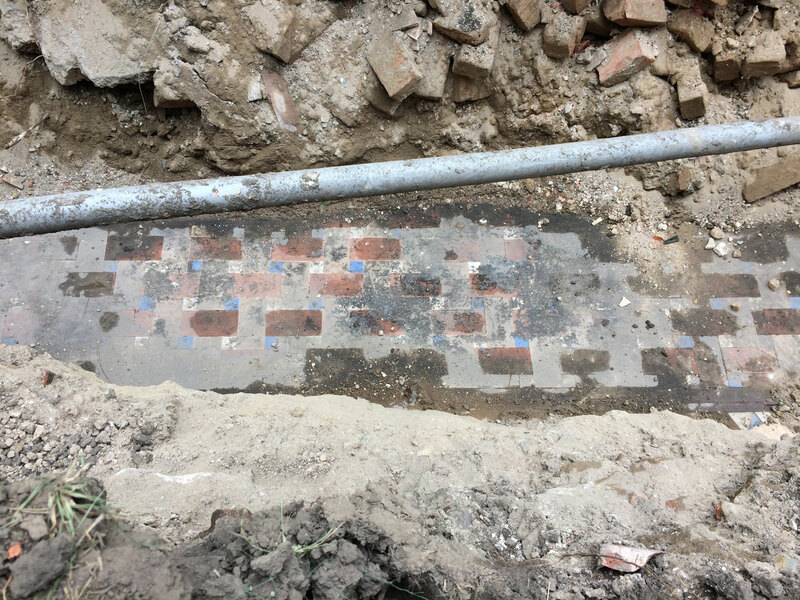 The recently exhumed tile reveals new information about the vibrancy of the building’s color. For instance, because the uncovered basement tile matches the same pattern as the court flooring, it shows us more detail about what that distinctive court looked like, including the presence of a dazzling blue tile in the mix. Other rubble found in the dig site includes warm orangey-brown exterior facing brick that was concealed by a layer of grey pollution at the time of the building’s demolition. Aside from providing new information about the Mecca Flats’ design, this recent discovery is also a test case for the emerging field of urban archeology. Among other consultants, IIT approached Rebecca Graff, an assistant professor of anthropology at Lake Forest College working in this field, to help determine next steps for this new archeological site. 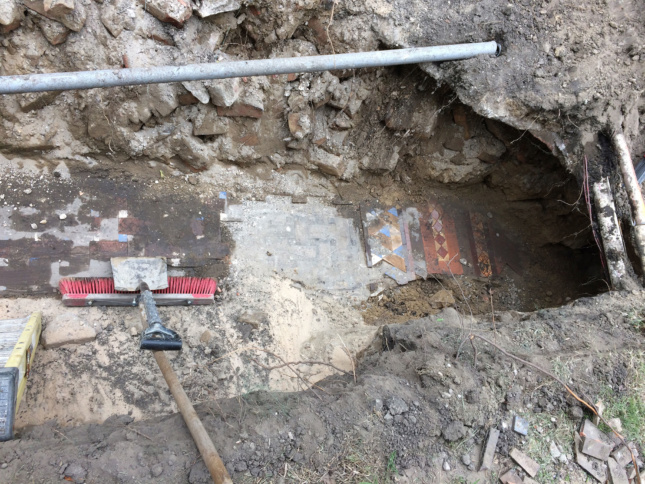 The university is pursuing a recommendation to document the conditions as found, and to remove, reassemble, and preserve the tile. A selection will be installed on site at the Graham Resource Center in the basement of Crown Hall in a permanent exhibition. Others will be donated to national and local cultural institutions to be conserved and shared with future generations. The IIT College of Architecture invites the public to view these artifacts for the first time since their excavation at a program entitled Shared History: The Mecca Flat Revealed at IIT Architecture. The event will take place in S. R. Crown Hall on Tuesday, August 7, at 12:30pm. Part cultural and part educational, the event will include talks and readings with community leaders, local historians, authors, and members of IIT, and will provide an opportunity to share and reflect upon how the unearthed artifacts activate collective memory. Many thanks to Tim Samuelson, Chicago’s official cultural historian, for his insight and knowledge that contributed to this article.